> > features between the two photo shoots. > optical illusion from the method of photography? It's possible, but I don't see how that would work. You can clearly see the flash reflection over the entrance to the Antechamber. The "stain" under the shaft portal is significantly off angle from the flash. And if that stain is under the shaft portal is indeed adhered limestone powder, we would expect to see it brighter than the granite at that angle. Likewise, the stain is at a lower elevation than the flash artifact and so it's not clear how that could be an artifact caused by that flash. Meanwhile, there is no indication of that western part of the room being illuminated by a 2nd flash. ...I believe it's Bodsworth's work (or maybe Bauval) in the late 20th century using an electronic light source that's far softer than magnesium powder, and the shot was likely taken after several SCA "restorations", wall cleanings, etc., so it's no surprise that the graffiti and stain had been removed by that time. Variations due to different processing methods is not "nitpicking" when it comes to photo contrast and spatial resolution. The bright signal under the shaft portal is there and must be reckoned with. Meanwhile, I don't see how that signal under the shaft can be explained as an artifact of the processing method or flash reflection off a granite surface. > something different there are nothing but problems. The problem isn't that it's "something different", it's that it's not logical. I don't see how that stain is anything but a stain of something physical occurring under that portal. whether it's chipping, guano, limestone powder or whatever, it's there and needs to be explained logically. 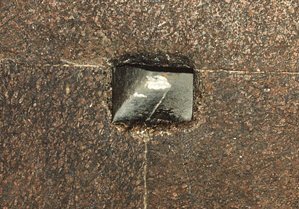 If you think it's an artifact of the flash, please explain how the light would reflect from the same flash to both the shaft and to the top of the entrance to the Antechamber. And why would I "want to see" the stain? The stain is there for all to see regardless whether anyone "wants" to see it. No one denies we see that on the photos. In fact, this is the first time I'm seeing it! I've never noticed that before this discussion (thanks Romulus the 2nd!). And yet it fits perfectly with the evidence that the north face gets most of the weather, that the north shaft was stuffed with sand, and that Edgar noted the hardened limestone powder at the bottom of the DP. Sorry, it's not clear to me what your point is by mentioning that photo. > > discussion, I wouldn't expect to see a "flow"
> > hit the north face, not the south face. That's certainly a possibility, but I think the evidence better supports a limestone stain under the shaft portal, that's all. The stain is too far off angle to be an artifact of the flash off a reflective granite surface. It could very well be that the Edgar photo is the only photo taken before any serious "restoration" was done to remove graffiti, stains, etc., from the walls. Well of course. The photographer was standing right in front of the portal this time (ie, perpendicular to the surface of the shaft) and so it's no mystery that the flash would be reflected back to the camera at that point on the wall. But even so, you still can see a remnant of the stain downwards from the flash radiation. 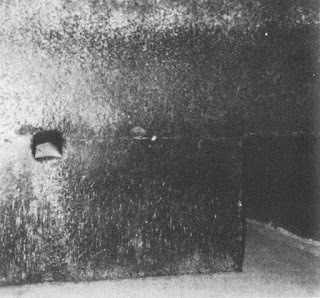 In any case, that's a Rutherford shot that was taken almost 50 years after Edgar's and after at least one wall cleaning since none of the graffiti observed in the Edgar photos are in Rutherford's photos. 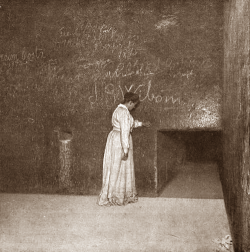 And that modern photo clearly uses very different film, processing, camera, electric lighting (note indirect wall lighting), and after the walls were cleaned of any graffiti...and limestone stain. You raised the issue of what you believe others "want to see", but from my perspective it seems to me that you are the one who does not want to see that stain under the shaft. And it's curious. I mean, it's not like that stain means the thing must therefore surely be a nuclear power plant, or a granary, or a UFO garage. It's just a hardened limestone mud stain confirming that the structure is very old, has an inclined portal to the outside that certainly could have collected rain, condensation,etc. that simply could have drained downward and carried some of the limestone powder dissolved into it. Why is that such a difficult "mystery" for some? Especially since there's evidence of weathering on that same face as documented by other investigators? Edited 3 time(s). Last edit at 14-Aug-17 23:20 by Origyptian.